Sewing Machines. Begin with a beginner sewing machine like this adorable "Hello Kitty" machine avaliable at Target. It has all the basics and and looks cool too! Fit The Snip! As soon as a child is ready, get a good pair of sewing scissors with a good fit to their hand. They will have 10 times more success in cutting out patterns if they have control and a sharp pair of scissors. Encourage them to keep a sheath/cover on the scissors when not in use. Create their own box of supplies. Sewing notions are available in fun colors and can be customized with stickers and paint pens. Creating “ownership” encourages children to take pride in their tools. I am 37 and still have and use my seam ripper I got when I was 13. Go fabric crazy! Fabric companies like, Alexander Henry, have so many hip fabrics for girls and boys. Everything from flaming skulls and skateboarders to sweet vintage style kitties and mod poppy flowers. The fabric selection for kids and teens has never been stronger. Beginner fabrics. Fleece is a great "cut and sew" fabric for kids because of its no fray properties. Working with cotton fabric is a great way to teach pre-washing, the grain of the fabric, pulling a thread and the warp and weft of fabric. Practice. Have kids practice sewing straight lines by having them sew on striped fabric. Great beginner projects: PJ’s, Skirts, Pillows, Jumper Dresses, Purses and Embellishing. Reference. Creating a stitch sampler/reference chart of stitches is a great way for kids to learn the different stitches on a machine and the different lengths and widths of stitches. Fashion Plates! Kids and teens have been customizing their clothes for years. Punk or preppy, adding details to their clothes like patches and funky trims are a great way to practice and teach hand stitching. Button Swap. Changing boring buttons to wild and fun ones is a great way to learn how to sew on buttons. Not just fashion. Kids are diving into home fashion projects and creating their own designer room style. 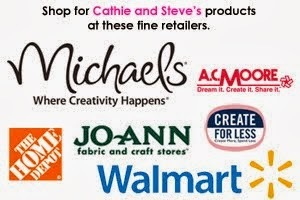 Television decorating and craft shows have helped to inspire and instruct budding little designers. Classes. Retail fabric shops like Jo-Ann Fabrics, have sewing classes for kids on the weekends you can also check with your local yellow pages for sewing lessons. promised my daughter the Hello Kitty Janome sewing machine when she turns 8 this month. Thanks for all these suggestions! I'll definitely put together a high quality notions box for her. Any suggestions of good learn-to-sew- books for kids? Hooray for sewing with kids! I posted some info on my blog about a few of the things I did to make beginning sewing easier for my daughter. She's almost six now and started sewing when she was four. The static link is at http://gratzindustries.blogspot.com/2008/01/jo-sews.html. I've been afraid of my own new machine, and now my daughter has a machine of her own that was given as a gift. I'm going to take some of your tips to heart. thanks!!! Sewing simple stuffed toys is a great place to start too. I helped my daughter sew a little stuffed bird by hand when she was 3, and she's done a number of other things since then (and since she got her own machine - a $20 EuroPro Dressmaker, which is great, but a b!tch to thread). Stitch cards (with pre-punched holes) helped early on, and "pockets" (simple pouches) and little tote bags are easy projects to get started. She is all the time wanting to make little things for her friends and her stuffed animals. Your son is so fricken adorable. That made me laugh out loud reading your post about him finding another job after he's married...what a cutie pie. He's going to make a fine husband one day for sure! This was the question of the day on my blog - how do I teach my daughter to sew. Thanks for a place to start. 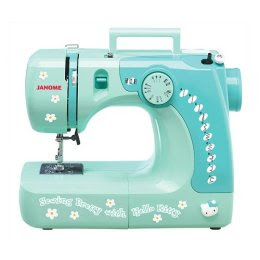 That sewing machine is really cute, I'm sure your kid would love to sew with something like that :) You can even have the girls make dresses for their dolls. Keep the fabrics colorful, patterned, and really vibrant. Thanks for sharing these wonderful ideas!